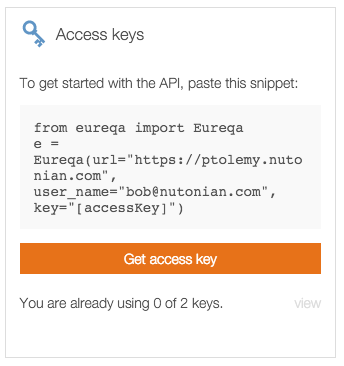 It is very easy to become productive with the Nutonian Python API - just ensure that you have the prerequisite Python version and Eureqa libraries installed, obtain an access key, and then connect. Details are below. The Eureqa API requires Python 2.7. Before getting started, verify your Python version or install it if you do not have it. Note: pip does have “-upgrade” flag which will upgrade to the latest version. We recommend not using this flag and instead using the command above to install the specific version that you need. Edit the Key name / description if desired and then select Generate Key. Copy and paste the access key into your code – the key will only be shown once! You may have up to 2 active keys a time. You can delete an existing key and generate a new key at any time. Now that you have the Eureqa API installed and have successfully connected to Eureqa, get started uploading data, building models, generating reports and more. Check out the Examples for sample code and the Eureqa API Reference for details on specific classes and functions. © Copyright 2016, Nutonian, Inc. Revision c2bcbea8.